A ghost who demands to be heard. This is a brilliant novella and a great paranormal pick-me-up to get you in the mood for Halloween – very much like Ghost Whisperer if you’ve ever seen the series. This is a great exercise in story-telling, fitting in two different plots within 175 pages and pacing everything just right. 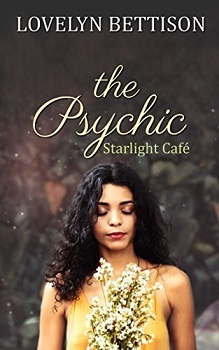 It’s a satisfying and fun read, even if the romance aspect is a bit lazy – I was 100% in it for the paranormal aspect and would have been satisfied without any romance at all. Cheryl is a likable main character with a past she’s trying to overcome, she’s struggling to make ends meet with her tarot card readings so she’s quick to take on a job helping a local man with a haunting problem and expand her repertoire of supernatural skills. I love the hauntings in this book and how they’re resolved, there are some spine chilling moments in there while we figure out what type of ghosts the main character is dealing with so we feel her fear as she explores this side of the paranormal. It’s difficult to review this title as the synopsis is very cagey about the specifics and I don’t want to give anything away, but if you like investigative ghost stories – you’ll enjoy this. Sign me up for the rest of the series if it features these main characters, I’m dying (pun intended!) to find out what happens next. In her stories, the normal world is slightly askew, magic happens every day, and ordinary people end up in extraordinary situations. Her novels explore the themes of loss, regret, and striving to be better. There’s almost always a love story. There is definitely magic, and she likes all her ending to be the happy kind. If you want to explore a world that is different than your own and full of quirky characters and unusual occurrences check out her books.